One of the reasons I bought a spinning wheel, was to learn more about British rare sheep breeds and their wool and eventually to be able to spin yarns that will emphasise a particular breed’s wool qualities. 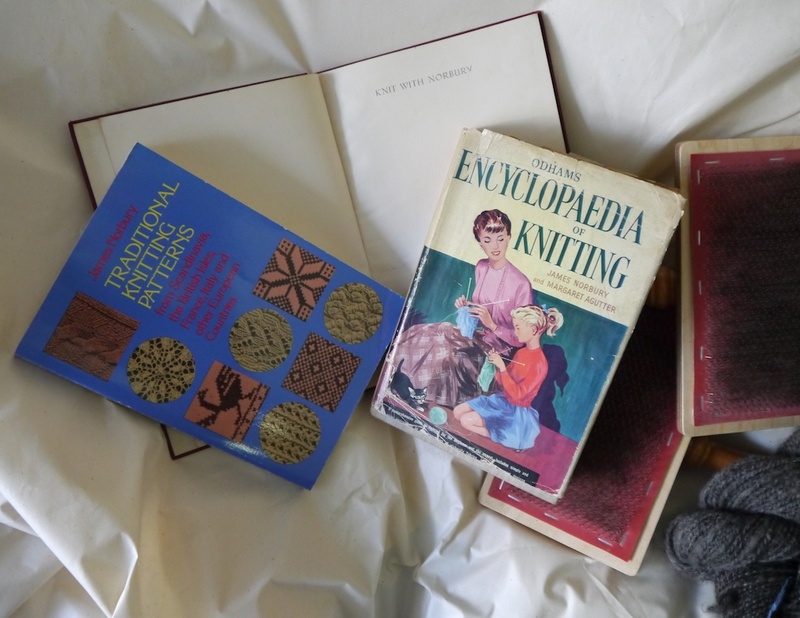 Always on the look-out for learning opportunities, I jumped at the chance to sign up for Deborah Robson’s Wooltypes workshop at Fibre East this year. Together with Carol Ekarius, Deb Robson wrote the Fleece and Fiber Sourcebook; a terrific compendium on a huge amount of different rare sheep breeds, their wool, and how to work with them. So far, I have only really used a worsted spinning technique. This is suitable for wool that has a longer staple (fibre length), but I expect that at the workshop we will also be working with shorter staple fibres. And for these fibres woollen spinning techniques are more suitable. For worsted spinning you prepare the fibres by combing them in order to get them all lying parallel; worsted spinning techniques aim to keep the fibres aligned – this results in a shiny, drapey yarn. For woollen spinning, however, you prepare the fibres by carding, and using a woollen spinning technique, the fibres end up all higgledy-piggledy in the resulting yarn. This makes the yarn lofty and very warm as it traps more air. So, what better fibre to use for practising making a woollen yarn, than the Shetland fleeces I brought back from Shetland Wool Week last year? 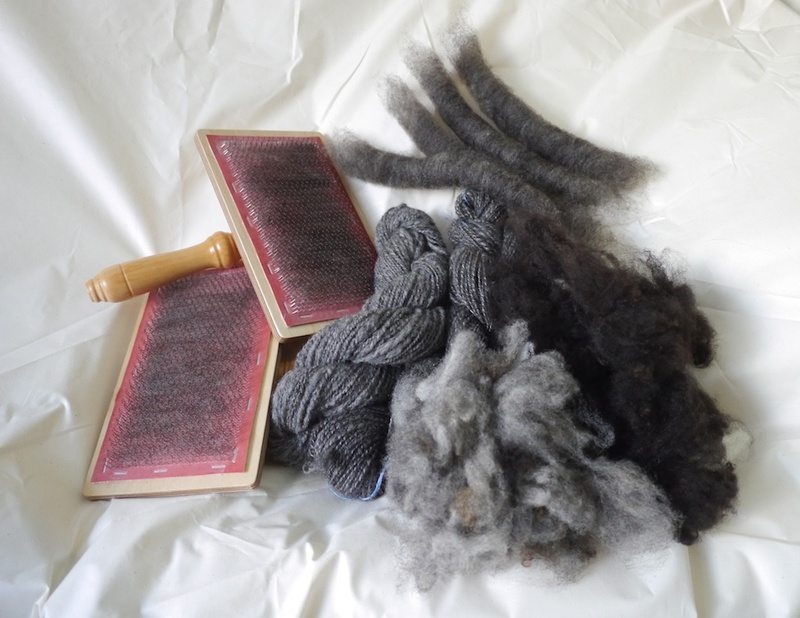 As I only have one grey fleece (this particular shade of grey fleece is called Shaela in the Shetland dialect) and half a black fleece I think I have just about enough for a jumper. So how to combine the two colours in one garment? Perhaps the most obvious choise would be some stranded colourwork, however, this will take up more yarn than something knitted with a single yarn in each row. I didn’t fancy stripes either, but then inspiration struck, and I came up with a cunning blending plan. I’ll be making a few skeins each in pure shaela and in pure black, but for the remainder I’ll blend the shaela with the black on the handcarders; you can see the resulting rolags (the fibre tubes) in the picture above, and I’ll spin these up into some more skeins. But that’s not all! To blur the transition from shaela to black even more, I will ply a blended single (the single strand that makes up a, in this case, 2-ply knitting yarn) with a shaela single, and also a blended single with a black single to make some marled yarns. In the picture above you can see a skein of pure shaela on the left, and on the right a marled yarn made from a shaela single and a blended single. James Norbury. Will I end up looking like this when I get older? So what does James Norbury have to do with all this? Norbury (1904-1972) was, according to Richard Rutt, the “strongest single influence on British knitting during the 25 years after the Second World War.” I have a few of his knitting books, and reading through the patterns, it’s always the superb shaping that strikes me and that is exactly what I’m after. Handspun woollen spun yarn is a bit lumpy-bumpy by nature, but seeing that this is my first attempt at making enough yarn for a big project, and because I don’t have a lot of experience in spinning woollen, my yarn will be even more lumpy-bumpy and probably look very homespun, in every meaning of the word. So to make up for that I want to make a jumper using meticulous shaping and really push myself with that challenge. I’ll be employing the very best knitting techniques I know, knit all the pieces flat, and use good shaping. An example of this is the sleeve caps that Norbury uses in his patterns. There are three progressive rates of decreases, so that the sleeve caps are very rounded, just like they would be for a sewing pattern. I did once knit a jumper like this, which I don’t often wear for other reasons, but the shoulder on it fits me like no other. 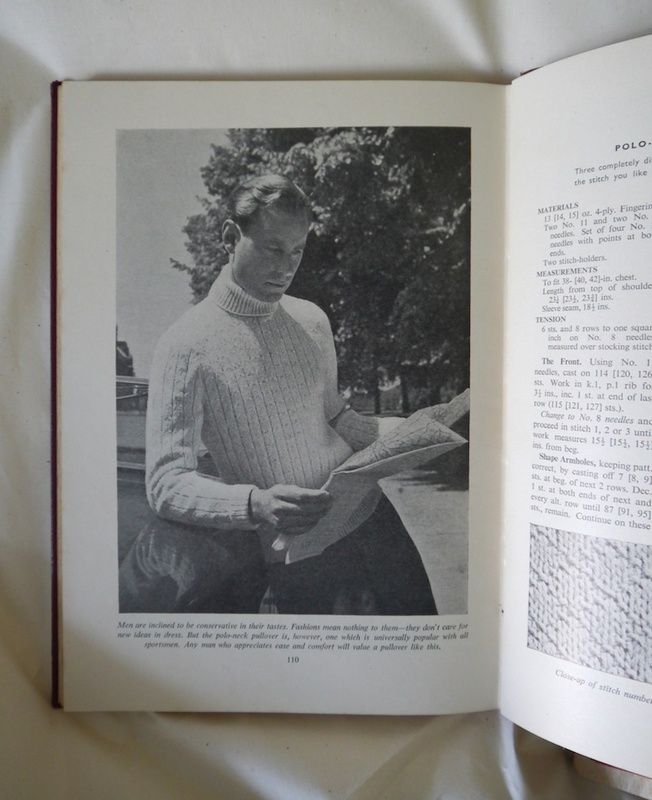 A polo-neck jumper designed by James Norbury; look at the shoulder shaping! I will be documenting progress here on my blog, but as I do like to switch between projects, I think it will take some time before this jumper will actually be on my shoulder, but that’s okay. I like making things that take forever, and now that I’ve added spinning in the mix, you can make that forever and a day. Once you get comfortable with spinning long draw from nicely-made rolags, you’ll get addictive. When I teach it, I love watching people’s faces when they suddenly realise what fun it is! I worry I might already be addicted to it. Looking forward to finally meeting you in person! I’m addicted to all spinning techniques. You will love your sweater, Tom. Don’t worry about unevenness: Think about spinning evenly, but without any overlay of worry–just spin with a rhythm that feels comfortable. Make a largish gauge swatch. I believe you’ll be pleasantly surprised. 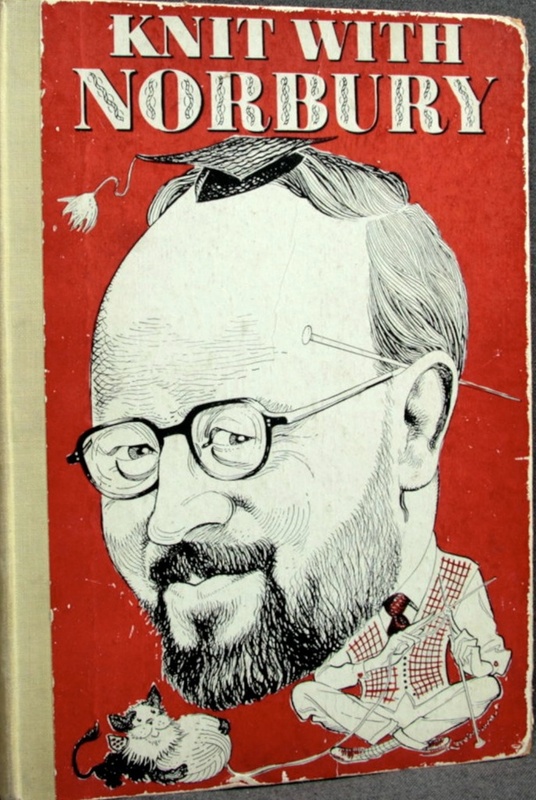 I’ve got that book and many others of that ilk. I find them an invaluable source of inspiration. hope the spinning goes well. look forward to seeing your progress. You will find that after knitting the woolen spun yarn, it poofs up with washing. My sweater settled into itself and there is no obvious lumpy bumpy trait. You will be surprised how much you like it. Also, I have found that after wearing my sweaters they settle into “my shape” somehow. Even with washing and blocking, they only fit me. I, too, like worsted for strong yarns, but woolen is my favorite for doing it’s own thing after everything is finished. Hello, James Norbury is the exact name of the main caracter of a novel I’ve just read, The Quick, from Lauren Owen. A recently published story about vampires, nothing about knitting. I guess the books you are writing about are better than this novel. Can’t believe you didn’t mention all the zoo animals posed with the knitting! Great idea to blend the 3 shades. I find if I just ‘go away’ and cogitate for a while a solution always pops up. Enjoy! I’m signed up for Debs workshop too. I received notice that we had to know how to spin. So I’m on my third handspun 😉 I plan on trying other staple lengths and preparations just so I can keep up with others in the workshop. Good luck with the spinning and see you at the workshop.